Located at the northeast corner of Hamirsar lake, this 18th century Aina Mahal palace or “Hall of Mirrors” is a perfect treat for the travelers coming to Bhuj. Built by Rao Lakhpatjiin 1761 and designed by Ram Singh Malam, its mind-blowing architectural design will put you in awe of its beauty. As you step inside, you will be awestruck to see the fine craftwork done with marble and glasses. The entire interior wall is covered with marble stone, adorned with gold lace and glass. The most striking feature of the palace is the shades of Venetian glass that separates mirror covered marble walls from the glided ornaments. However, the palace did face a damage during 2001 Gujarat earthquake. But the natural calamity was unable to cause much ruin to this palace. And at present, the damaged portions are already being repaired. If you love ancient architecture, then make sure you visit this palace that represent itself as one of the ideal example of Indo-European architectural design. How popular is Aina Mahal? People normally club together Bharatiya Sanskruti Darshan Museum and Prag Mahal Palace while planning their visit to Aina Mahal. 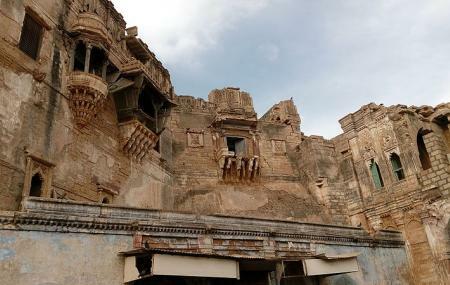 If you are in bhuj, this is one of the place you should visit. Nominal entry fees is there but if you want to do photography even by mobile phone then you have to pay extra. About 30 minutes is required to visit this place. Not expect to much, but we can see the glory of past, they try to maintain the property but on many items you may find lot of dust. Outside the place some small shops are there who sale local items at reasonable price. An old palace with very few " aina " i.e mirrors left after the palace survived the earthquake in 2001 . People who like museums love it else it would be boring to walk through seeing the things Kings had used . Not to miss - the single colorful glass windows (or wall dunno what to call ) which is still intact. Dunno why they haven't repaired the broken parts of the palace after the earthquake. Historic place with lots of historical things which can amaze you. The structure itself is old. And if you enjoy something unique old historical places this is it.